Humanised in delicate words and knowing phrase. Very well executed homage. Your generous praise makes me want to keep writing so I can live up to it. Thank you. Reblogged this on The Poet's Nest. What a gift! Thank you for visiting. I’ll swing by and visit you there. You just made me cry…thinking of my grandmother. It’s hard not to tear up sometimes, eh? I caught a whiff of mine the other day opening a trunk full of her handkercheifs. 10 years since she left, and it’s like she walked right up to me and gave me a squeeze. Nice poem! Please remember her the way she was. May her memory be a blessing to you! It is, she was. I so appreciate your thoughts. The kiss is all! Your blog is gorgeous! The kiss is always all, ain’t it? This was perfectly written. Thanks for sharing, you really got into the delicacies of this woman and shared it so effortlessly, or at least it looks that way. What a kindness, your words. I hope my writing can improve enough to earn it. Calling her up is the effortless part. Capturing it? That’s where I rely on her to guide my hand. They say it’s a lost art, but boy, sometimes it’s the only way in. Thank you for this. I was reminded of my mother. I’m so glad this called up a memory. I hope it was a good one. I absolutely love this. Beautiful. Thank you! I enjoyed visiting your site and seeing what you are making, other than lemonade. Interesting read. You inspire me. Oh, good! I hope the inspiration leads you somewhere unexpected. such a vulnerability in your words, excellent composition! btw, who is she ? Mary Frances. Paternal grandmother. Dancer. Writer. Neighbor. Hugger. A great poem and post. Thank you. This is wonderful. Congrats on being Freshly Pressed! It’s so fun to have new visitors and to find new, interesting sites to go explore. Thanks! I was a river murmuring in the noonday shade of the trees, coursing through soft green banks. We love each other for the sum of what we are. Implicit with movement, even in repose. “We love each other for the sum of what we are.” Yes. Maybe also despite the sum at times? Thanks so much for the reblog! So kind of you. What a great gift to your family! Thank you! She was the one who was the gift. This is just payback. Lovely. Your memories must be so warm and comforting. Thank you for sharing. Wow. Very moving and so full of love. Hi! i like your poems!!!! i am following your writing…. waiting new writing. good bye. You can’t help not smile back at her picture. Lovely Lady. It’s hard to believe any of us was ever so young, eh? I realized not too long ago that I don’t have any grandmothers left. I can say that I was fortunate enough to have a great grandmother live until I was nineteen. She was born the year before the Titanic sank. This reminded me of her. I hope you remember her well. Thanks for sharing what this brought up for you. Such a Beautiful poem, it reminds me of my grandma. I always remember though that our loved ones always follow us after they are gone. They watch over us and protect us. I am glad you have someone with that much love in your life. It’s true. Sometimes the people longest gone seem closer than someone sitting right next to me. I understand why so many of us believe in ghosts. Well, howdy, Beeseeker! It’s nice to see you here again. As ever, I appreciate your thoughts. Wow…that left me teary-eyed. How beautiful! Thank you for visiting and for the kind words. This is simply beautiful! I absolutely love it! Oh, thank you for the re-blog! It’s so nice to know you’re sharing this with others. I really enjoyed it! Not a problem! Beautiful ode to your grandmother and beautiful photograph. I have lately been writing about my great aunt and this inspires me to continue with that. Your grandmother has a very genuine, optimistic smile. If your grandmother would have been 102 then my rough calculation would be this picture was taken in . . . 1931? Wow, the depths of the Depression and she could still smile like that. She must have been made of tough stuff. You’re an excellent poet by the way. I have a blog post on Baudelaire you might be interested in. It’s funny. I have thought of her age then, as I often do. It didn’t occur to consider the historical context of the photo. 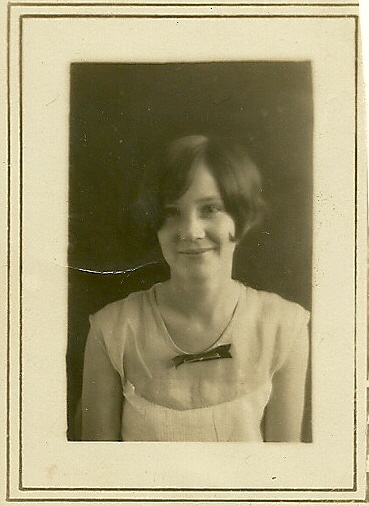 I know she had no photos taken at the wedding when she married my grandfather because of war rationing. The only record of it is a brief announcement on yellowing newsprint from the local paper (though I suppose all of us are proof enough!) Thank you for coming by and sharing your thoughts. I’ll just add my comment that this is beautiful! Hauntingly elegant imagery and yet simple at the same time. Thank you for reading and for sharing your experience of this. So glad that you shared her beauty w/us! Nothing like a mature Southern woman! Prayers for your peace as you grieve! No reason you can’t take some of those dreamy photos now! Thank you for the kind words. Loved it 🙂 truely amazing poem. This is amazing. Thank you so much for sharing this – it’ bittersweet to miss someone so dear. So poignant. It is the way we all should feel. How we miss our grandmothers! Lovely. I knew it would be from the photo and the title.